Add art you love to your space! Artwork is one of the most personal accessories in a home. It should speak to the owner’s sensibility in terms of subject matter, color and general aesthetic. Art is a great way to introduce color and texture to a space and contribute to creating “the finished look”. Art comes in many forms: it could be a sculpture, a painting, pictures you framed from your favorite places or any other type of art form you enjoy. 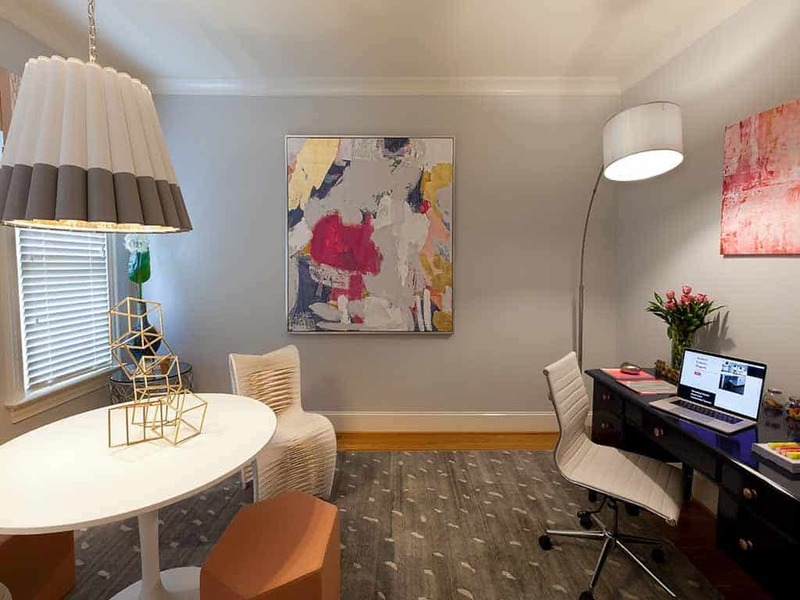 When choosing a piece of art for your space, an important consideration is size. Artwork that is too big will make the space look small and crowded and artwork that is too small will just seem out of place. 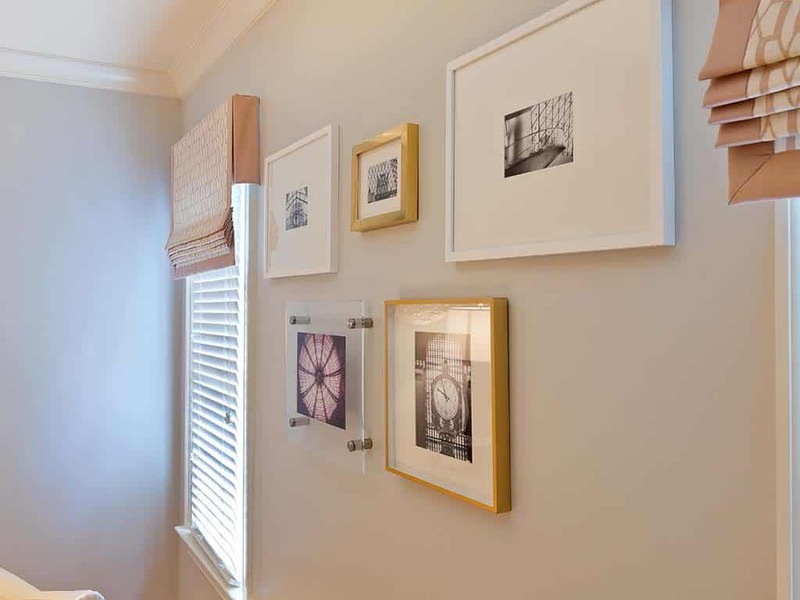 If you have several smaller art pieces hang them together to create a group: this is visually more impactful that hanging them separately. In this home office we hung an over sized abstract modern piece of art. It not only added the color and texture we needed but set the tone for this space. This space had colorful artwork hanging from 2 other walls. Our long wall looked bare, but we did not want to overwhelm the space with too much color. We decided to go for texture instead of color. 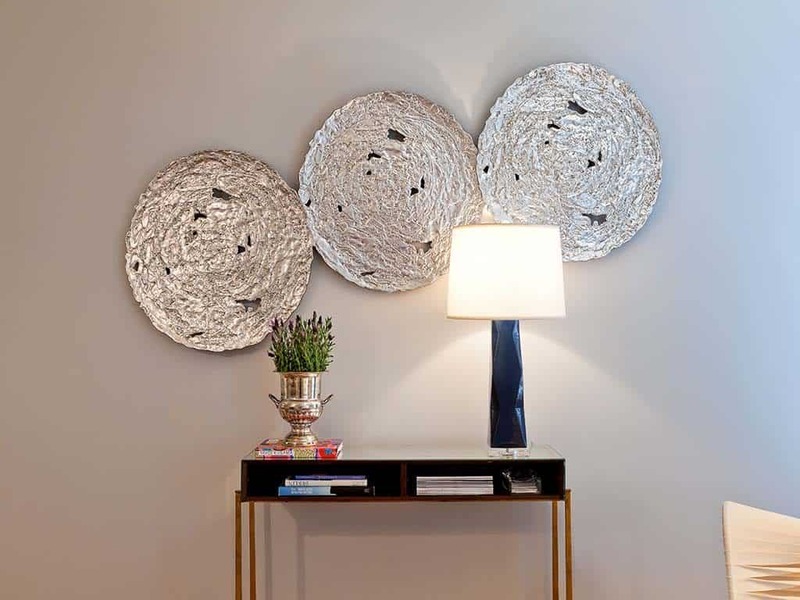 These round molten discs are the perfect finishing touch for our space. Window treatments can make or break a room. Window coverings not only protect your furniture, rugs and flooring from sun damage and help with noise reduction but also soften the look of any space. Consider adding beautiful fabric panels to frame your windows; they add color, texture and just give a space a finished look. 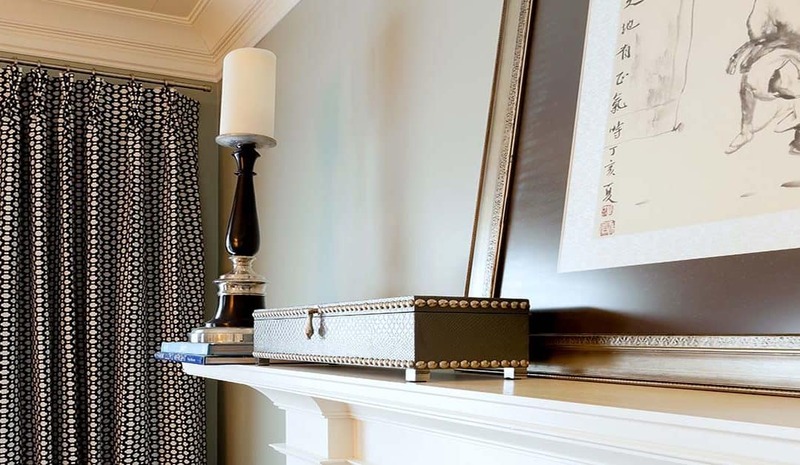 If you are not too much into fabric, you can also add roman shades, faux shades or a pretty valance. Window treatments make a room cozier and add instant personality to any room. 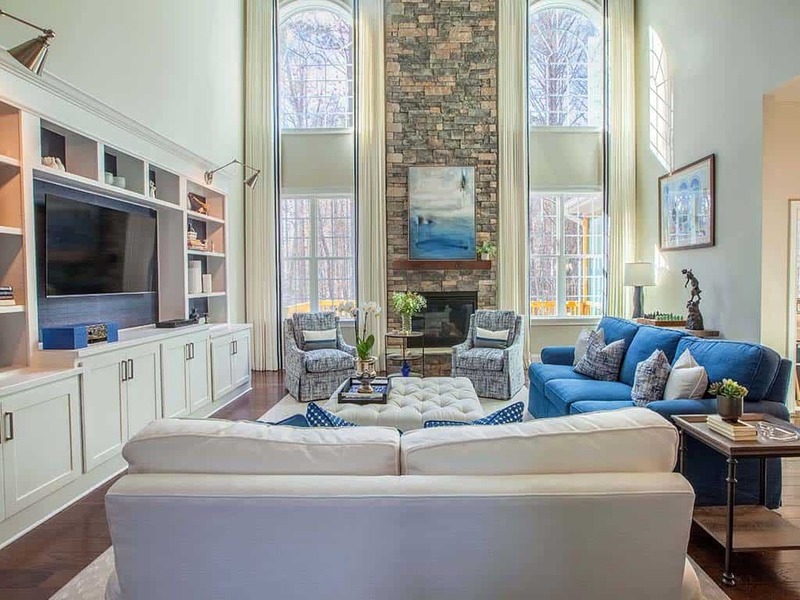 We added these fabulous white fabric panels embellished with a navy blue trim tape to draw your eye up to admire the beauty of the vertical space They definitely add the wow effect to this living area. Sleek faux roman shades in a pretty fabric can also be used on your windows to add texture and color to the space. Soft, plush throw pillows complete any room. To me, pillows are not only a great way to add color, texture and pattern to a space but they can act as the magical element that pulls a room together. If you have different colors and patterns going on in your space, the perfect pillows in the perfect fabrics will tie the room together. Pillows come in a variety of shapes and sizes: square, round, bolster and rectangle. Mix different shapes, sizes, pattern and colors to create a visually interesting and beautiful space! 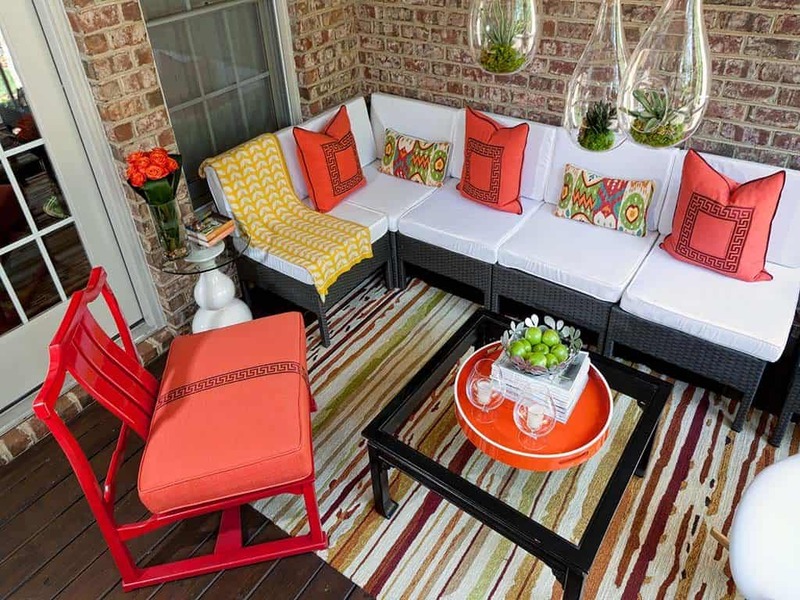 We added throw pillows in different sizes to add pattern and color and tie this outdoor room together. We love how much more interesting the space looks with the use of our pillows. We created a neutral background for this teenager bedroom. 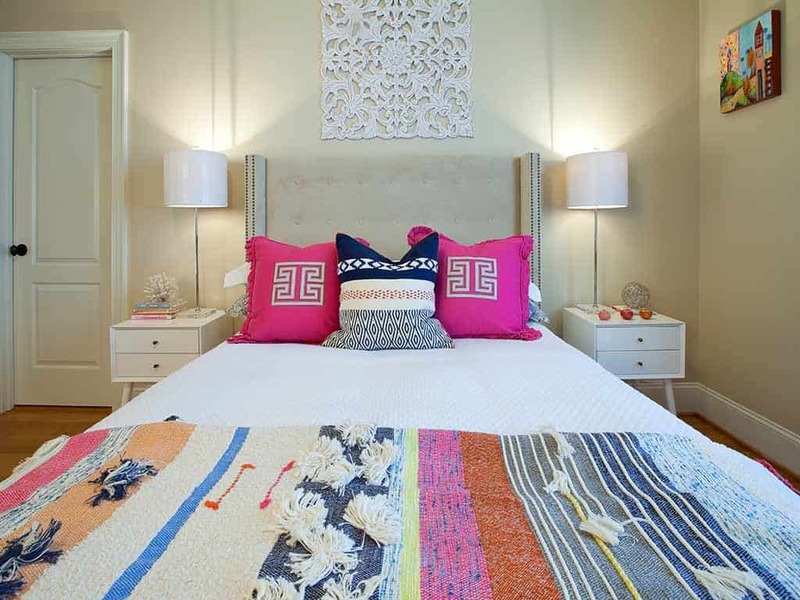 We added color and pattern to the space through the use of colorful pillows and a wonderful textural throw. If our teenager gets tired of the color scheme- no problem! We change the pillows and throw out and get new ones for a different look. Those are my favorite 3 finishing touches for every space. Try implementing them and let me know how it goes!